Griffin delivers iPad and iPhone accessories for every occasion | What Hi-Fi? The Cinema Seat (pictured) is a simple iPad case ideal for subduing noisy children on car journeys. 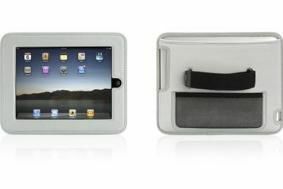 Stick your iPad in the case and a strap allows you to attach it to a headrest for backseat viewing. It's yours for £30. If you'd rather just wander around with the iPad strapped to your hand, then the AirStrap is the one for you. A similar idea, this case simply has a band in to which you slip your hand. Price TBA. For something a little more permanent you could try the Cabinet Mount. As it sounds, this allows you to have your iPad on a shelf, wall, desk or wherever you can find room for this bracket. And there's more. How about the PowerBlock Micro? It's just a plug, yes, but it's a small one. With a USB connection you can connect and charge most USB-devices – and it won't block off any nearby plugs. It's £20. Also new is the Armband for iPhone/iPod Touch. Designed to work with the Adidas miCoach app, the Griffin-made band is lightweight on your arm and will keep your portable secure. See the Griffin website for more information on these products – and more – and find them on sale there and at the Apple Store.